Put a stop to refusals with this guide to nailing more consistent takeoff spots. If you do much jumping, you’ve probably heard your trainer—or highly observant equestrian friend—utter that admonishment after a refusal. Don’t be discouraged. Possessing a natural “eye for a distance” or takeoff spot is a rare talent; most of us have to develop it through endless hours of dedicated practice. 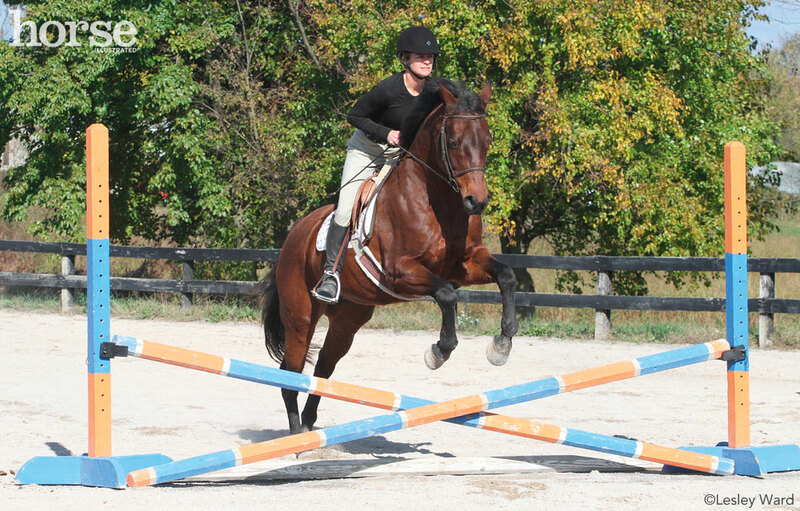 Here’s an overview of how you and your horse can become spot-on in jumping. Just about any horse can leap over a 3-foot obstacle. In the wild, it’s a trait necessary for survival. Yet once a rider is aboard, the horse’s balance and center of gravity is affected. A rider also exerts a certain amount of control over the horse’s jumping effort. As a result, the takeoff spot (the place in front of the jump where the horse takes flight) is often manufactured more by the rider’s judgement than the horse’s natural instinct. Takeoff spots that are either too short or too long can scare the horse enough that he stops. Moreover, any last-second changes on your part, like suddenly sending him forward with more leg or, conversely, grabbing his mouth in an ill-fated effort to collect his stride, is essentially to lying to your horse. It undermines his sense of trust in your decisions, so he stops. The secret to creating acceptable takeoff spots is simple: establish, and then maintain, an even pace and a steady length of stride throughout your jumping course. Then your horse has a chance to prepare mentally and physically for each jump. To put this idea into practice, scatter ground poles around the arena in a way that resembles a jumping course. For lines (two poles in succession), shorten the typical distance by several feet since your horse won’t truly be jumping. For example, a three-stride line of ground poles should be set about 40 to 44 feet apart versus the usual 48 feet. You may also adjust the distances according to your horse’s natural canter stride. Pick up a working canter and ride the course of ground poles. Try to maintain the same pace and length of stride from start to finish. You can make minor adjustments using your aids, but ideally your horse should seamlessly incorporate each pole into his canter stride. Consider any bold leaps over the poles to be similar to a super long takeoff spot. Disjointed, broken strides, which feel as if your horse is swimming over the pole, represent weak, short takeoff spots. Don’t be discouraged if you struggle with this exercise. It’s much more challenging to do correctly than it first appears. It may help to count down the last four strides before each pole. 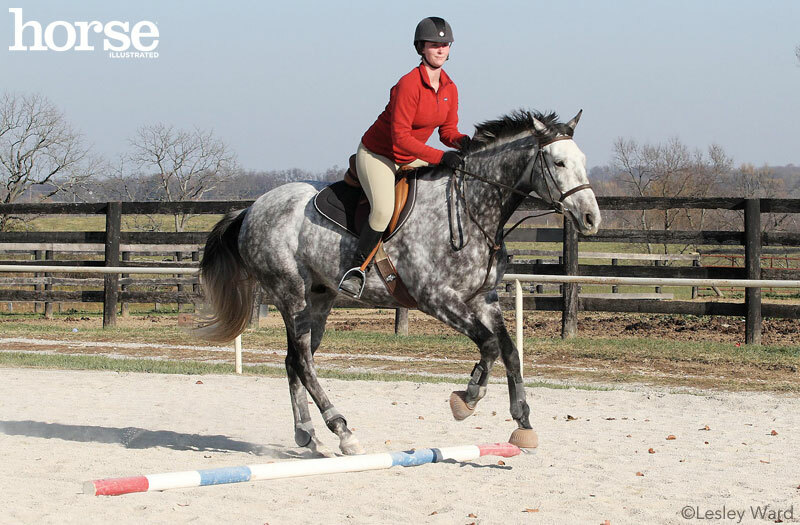 Count in time with your horse’s canter steps: “4, 3, 2, 1.” Your horse should canter over the pole on the number 1. 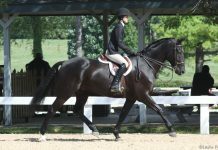 With practice, you’ll begin to see or visualize how many strides your horse is going to take before cantering over each pole. This is the first step in developing a “good eye.” Eventually you can use this counting tactic when jumping actual fences. 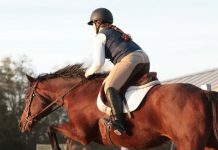 It will help you stay in sync with your horse’s canter, and you’ll be less likely to make awkward, last-second adjustments that unnerve your horse.